Kathmandu Medical College And Teaching Hospital (KMCTH) is a medical school located in Kathmandu the capital city of Nepal. 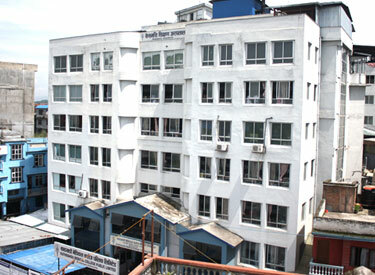 Established in 1997, KMC is a private medical college in Nepal. The college is permanently affiliated to Kathmandu University and fully recognised by the Medical Council of Nepal, Sri Lankan Medical Council, General Medical Council (UK) and Medical Council of India. Kathmandu Medical College Teaching Hospital has also been listed in the WHO's World Directory of Medical Schools electronic format as from June 2002. Following full recognition by NMC, KMCTH is also listed in the International Medical Education Directory (IMED). KMC is an Associate Member of the Network Towards Unity for Health (TUFH) that has its headquarters at Glent in Belgium. Kathmandu Medical College (KMC) functions from two complexes - basic sciences at Duwakot, Bhaktapur and clinical sciences at Sinamangal. The main hospital is located in Sinamangal near to The Tribhuvan International Airport. Besides a community hospital is built near the basic science campus in Duwakot. Emergency service and General OPD Service is already started in first and second floor of the 11-storeyed building of Duwakot. KMC is a private college in Nepal affiliated To KU. Many unofficial ranking of medical colleges of Nepal, puts KMC at 3rd place after one governmental and one semigovernmental institute. Around 115 students are enrolled annually among which 20 are selected from Ministry Of Education, Nepal under Scholarship category. The rest 95 are selected strictly from merit basis of KUMET exam. The Bachelor of Medicine and Bachelor of Surgery is a four and a half year integrated program followed by a compulsory internship training of one year. The standards and criteria adopted by KMC are in strict adherence to the requirements of Nepal Medical Council and Kathmandu University. The first two academic years focus on basic medical science with interdepartmental integration as well as clinical and community correlation. A holistic approach to health and health care system in Nepal is taken. The course starts in August every academic year.